1 Saudi Arabia 8,300,000 2018 est. 3 Iraq 3,800,000 2018 est. 6 United Arab Emirates 2,684,000 2014 est. 7 Nigeria 2,279,000 2014 est. 8 Angola 1,700,000 2014 est. 9 Kuwait 1,656,000 2014 est. 10 Venezuela 1,514,000 2014 est. 11 Kazakhstan 1,292,000 2016 est. 12 Qatar 1,255,000 2014 est. 13 Norway 1,395,000 2016 est. 15 Iran 2,742,000 2017 est. 16 Azerbaijan 813,000 2018 est. 17 Algeria 798,900 2014 est. 18 Oman 785,000 2014 est. 19 United Kingdom 636,000 2016 est. 20 Colombia 681,000 2015 est. 21 Brazil 518,800 2014 est. 22 Ecuador 400,700 2014 est. 23 Libya 385,500 2014 est. 24 Indonesia 338,100 2010 est. 25 Equatorial Guinea 319,100 2010 est. 26 Australia 314,100 2010 est. 27 South Sudan 291,800 2010 est. 28 Republic of the Congo 290,000 2011 est. 29 Malaysia 269,000 2012 est. 30 Gabon 225,300 2010 est. 32 Yemen 175,200 2010 est. 33 Denmark 155,200 2010 est. 34 Bahrain 152,600 2012 est. 35 Syria 152,400 2010 est. 36 Brunei 147,900 2010 est. 37 Chad 125,700 2010 est. 38 Sudan 97,270 2010 est. 39 Argentina 90,920 2010 est. 40 Timor-Leste 87,000 2010 est. 41 Egypt 85,000 2010 est. 42 Cuba 83,000 2012 est. 43 Tunisia 77,980 2010 est. 44 Trinidad and Tobago 75,340 2010 est. 45 Turkmenistan 67,000 2012 est. 46 Cameroon 55,680 2010 est. 47 New Zealand 47,290 2010 est. 51 Côte d’Ivoire 32,190 2010 est. 54 Democratic Republic of the Congo 22,240 2010 est. 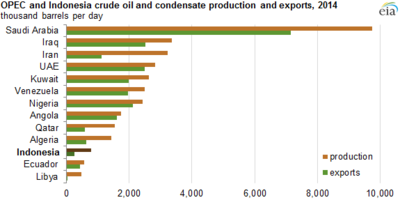 Academic contributions have written about differences in petroleum revenue management in various countries. 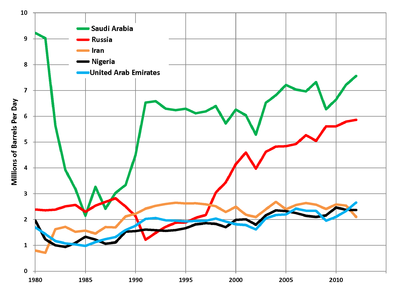 Many scholars see the natural resource wealth in some countries as a natural resource blessing, while in others it has been referred to as a natural resource curse. A vast body of resource curse literature has studied the role of governance regimes, legal frameworks and political risk in building an economy based on natural resource exploitation. However, whether it is seen as a blessing or a curse, the recent political decisions regarding the future of petroleum production in many countries were given an extractivist direction, thus also granting a status quo to the exploitation of natural resources. The PRIX index forecasts the effect of political developments on exports from major petroleum-producing countries. ^ Sachs J. D.; Warner A.M. (2001). “The curse of natural resources” (PDF). European Economic Review. 4 (45). ^ Tietenberg, T. H.; Lewis, L. (2000). “Environmental and natural resource economics”. ^ Ross, M. L. (2003). “The natural resource curse: How wealth can make you poor”. European Economic Review. ^ Wilson, E.; Stammler, F. (2015). “Beyond extractivism and alternative cosmologies: Arctic communities and extractive industries in uncertain times”. European Economic Review. 3 (1). ^ “Nuclear Negotiations, Restructuring at Chevron and a New Political Risk Index for Oil Markets”. Alberta Oil Magazine. 2015-06-29. Retrieved 2015-09-26.